Searching for the perfect holiday gift for someone special? 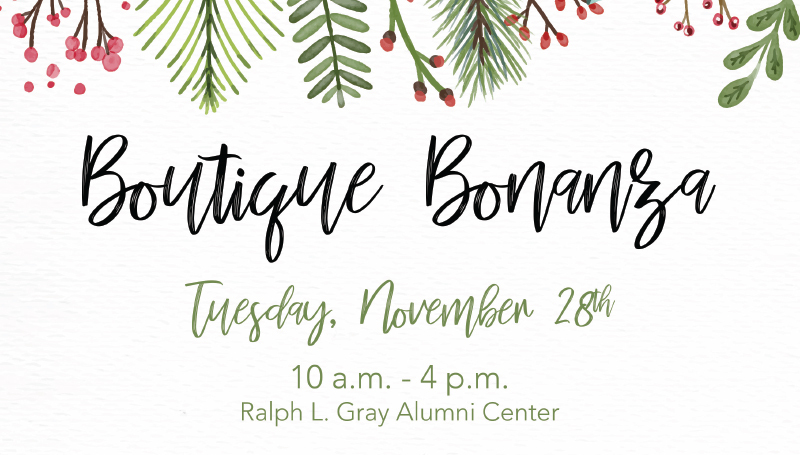 Don’t miss the Boutique Bonanza, set for 10 a.m. to 4 p.m. Tuesday, Nov. 28, in the Ralph L. Gray Alumni Center at Missouri Southern. The event, which is open to faculty/staff and the community, will offer a one-stop shop for a wide variety of gift ideas. It will unique feature items from Annie Kate’s, Bhayes Designs, Diamond in the Rough Boutique, Her Saving Grace, Miss Daisy’s Attic, One of a Kind by Carol, Pink Rose Gift Shop and Walnut Springs Art Barn. “It’s a wonderful way to finish out your weekend of holiday shopping madness,” said Lee Elliff Pound, director of alumni and constituent relations. “You have Black Friday, Small Business Saturday, Cyber Monday and then Boutique Bonanza on Tuesday. For more information about the event, contact the Alumni Center at 417-659-5466.